How to interface IPM version 9.2, build 6156 with Lumenera camera. Image Pro Premiere prompted me to download and install the latest update, version 9.2 build 6156. Now it does not recognize the camera. I wonder if I made the wrong choices on the initial setup screen when the software asked which parameters I would like to save from the previous version. Any suggestions? Thanks. The update to Premier version 9.2 should not affect the camera recognition, regardless what choices were made on the startup prompt. One thing you can check is to verify that you are using the latest version of the Lumenera capture interface. To do this go to http://www.mediacy.com/support/hardwaresupport to look up the camera model and see what is current for your camera. The Lumenera Family capture interface that supports most models is version 9.1.1. 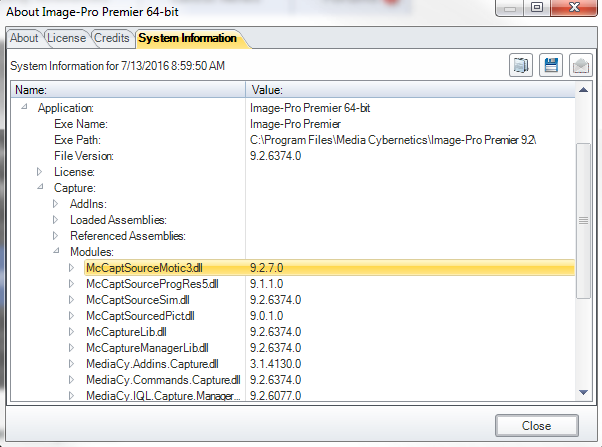 The About box in Premier will show the capture interface versions in the System Information tab as shown in the screen shot. Also, make sure the camera is functioning properly by testing with the Lumenera Infinity application. If everything checks out, then please contact technical support at [email protected] for further assistance. Thanks. Everything worked fine till I upgraded from version 9.1.4, build 5638. I'll contact tech support.